Vahid Halilhodzic was appointed the coach following Les Elephants disappointing early exit in the 2008 African Cup of Nations. The Bosnian born manager would suffer the same fate as his predecessor following a quarter-finals loss at Angola 2010. The new man recently appointed to be in charge is Sven-Goran Eriksson. Eriksson is a man very familiar with the World Cup finals having coached England in the 2002 and 2006 World Cup finals to quarter final exits. Eriksson has kept intact the 4-3-3 formation with four back line defenders, three midfielders, a right and left wing, and a striker up top. Didier Drogba is the key man of course and Chelsea teammate Kalou will likely join him on the left wing. Drogba is of course the main man and is considered one of the most talented finishers in the game with the double winning Chelsea Blues, but will he play later this week? Kalou makes for a formidable duo up top if he does. The Toure brothers are both fantastic with Yaya from Barca playing in the center midfield and Kolo from the EPL playing at center back. Eboue is another reliable EPL defender as well. Overall they are the most talented African squad. The Ivory Coast wants to be the first ever African champs and many are keeping their fingers crossed for Les Elephants considering they are playing on African soil. And the true test for the squad is advancing past the death group and onwards. If they can outlast Portugal for that second spot then anything is possible in the later rounds. But the squad will be tested early on in their Cup campaign, but Drogba gives them an advantage of nearly all teams in the Cup’s attack game. The words “Death Group” don’t exactly paint a pretty picture of unicorns and puffy white clouds does it? In fact it should strike fear into the hearts of Africans everywhere. It could be a tough Cup for the home continent simply because of several tough draws including their best squad in Les Elephants. The talent is there, but it also is there with Brazil and Portugal. It’s unfortunate, but somebody had to go home early and last Cup it was a similar story for Les Elpehants who faced Argentina and the Dutch. Plus if Drogba doesn’t play then this team is finished. 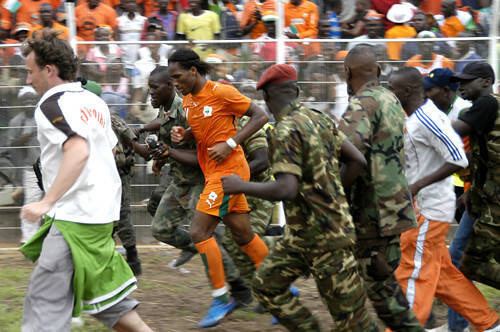 If the Ivory Coast wants to win the World Cup then they simply need Didier Drogba to be the Top Gun of the tournament and lead in total goals scored. Of course there is no need for the team to oil themselves up and play a match of beach volleyball after they win. Although Didi does love to go shirtless. But if the Ivory Coast fails to advance then it will be considered a huge bomb of a summer and will deserve the title of Operation Dumbo Drop starring Danny Glover.